Join us for a free webinar on June 14, 2016. 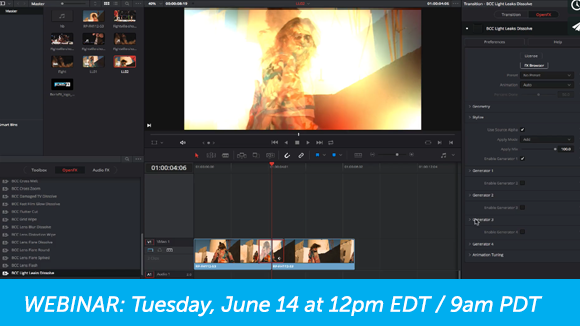 Join Dan Harvey, special guest presenter & finishing artist, as he shows Blackmagic DaVinci Resolve users how the new Continuum Complete 10 OFX plug-ins can be used to complement professional color grading & finishing projects. Quickly add credit rolls with Title Studio and more! Dan Harvey is a UK based post-production industry veteran with years of teaching and post-production expertise. Dan has worked as a professional colourist and also as a product specialist & manager for Autodesk, The Pixel Farm and Quantel. Dan is currently a visiting tutor at the National Film & Television School.